The way an instrument is tuned and regulated, often overlooked, can make the difference between a pleasing performance and one that is truly exceptional. Mr. Koerber began tuning his instruments at the age of 16, and always prepares an instrument prior to a performance. "It makes all the difference in the finer points of artistry, and to lessen or dismiss this technical aspect is to be out of tune with delivering the best performance possible." He is also available for residential, concert and commercial tuning opportunities. Schedule your tuning today. 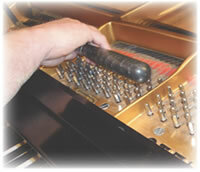 CLICK HERE to schedule your piano tuning today.